In Ubuntu 10.04 or other older version of ubuntu or other linux based operating system there are many command line utilities are available but this post will try to introduce you with a GUI application program to know the details of your PC’s hardware from Ubuntu 10.04.A simple application, that is used to know about technical details of computer’s hardware, is GNOME Device Manager.So GNOME Device Manager will give you the full information about the hardware components of your PC in view mode(you can’t configure devices configuration by using GNOME Device Manager). 1. Open Synaptic Package Manager from System->Administration->SPM(Synaptic Package Manager). 2. Search for the string “gnome device manager” in quick search box. 3. 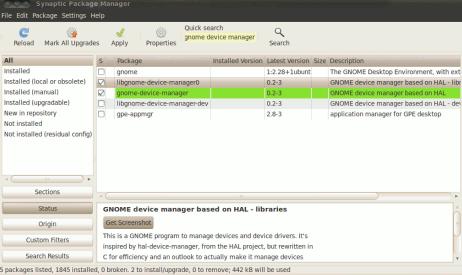 Mark the GNOME Device Manager row for installation and click on Apply to install the GNOME Device Manager. 4. First the downloading will start and then it will finish in few seconds.Now Installation will begin and it will also take less than a minute. 5. You have installed the GNOME Device Manager on your Ubuntu successfully!! 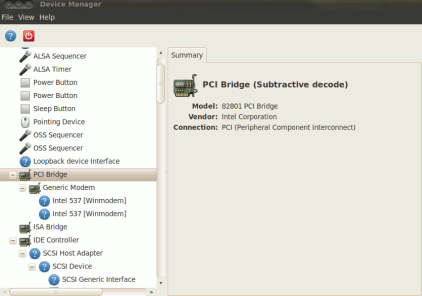 You can use it from Applications->System Tools->Device Manager.